Material:wooden laptop board with metal frame. Left larger rotating board size: 15.7*15.7inch. right smaller solid board size:7.9*15.7inch. Can hold almost 11.8*21.7inch laptop. 1. Height Adjustable laptop desk: 360 degree swirling castors with locking device, 5 wheels, 2 of them with locking device, so it is easy to mobile and stable. You can move it anywhere easily. 2. Computer Laptop Desk:Fixed bracket and Adjustable height, the updated desktop increase2 fixed bracket to enhance the Stability, 5 adjustable height settings to meet different height requirements. 3. Sofa sturdy laptop table:Suitable for both right and left hands. the desktop can be swicthed to both side, it is also suitable for Left-hand. 4. Bed laptop desk:Unique design and popular appearance- the single pole under the frame can save large space, you can comfortably stretch your legs. adjustable laptop desk---5 ADJUSTABLE HEIGHT: From 28-35.8inch. Left larger rotating board size is: 15.7*15.7inch, right smaller solid board size is: 7.9*15.7inch. Can hold almost 11.8*21.7inch laptop. Wheels height: 2.75inch. adjustable laptop desk---ROTATING BOARD: 45°rotating angle from each side, also suitable for left hander. Starting working more comfortably and with less aches&strains. adjustable laptop desk---2 SIDES PROTECTING BAFFLE: The specially design baffle can prevent the laptop from falling on the floor, bed or ground. 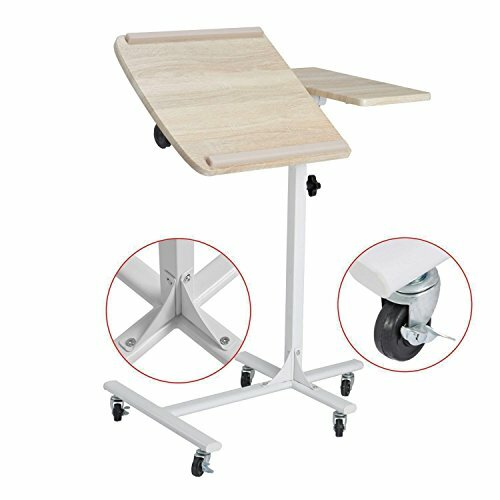 adjustable laptop desk---MOVABLE AND FIXED: 5pcs great moveble wheels, 2 of them with locker.you can work anywhere in home, office and so on.In addition, this upgrated laptop deskchanges into industrial wheels instead of outdated plastic wheels, will make your life easier and convenience. If you have any questions about this product by Coavas, contact us by completing and submitting the form below. If you are looking for a specif part number, please include it with your message.